Strip Brushes are really useful for aiding in the capture of dust and chips being ejected from the milling process on the CNC machine (the router or spindle cutting process). The dust shoe that can be found on most of our CNC machines uses this strip brush. The strip brush encloses the cutting area and the vacuum creating an area of negative pressure, so the chips or dust will be carried directly to the vacuum end. The strip brush also serves as a wall or barrier that the chips will hit rather than getting ejected into the air. Just make a groove the same width of the rubber side of the brush and glue the brush in. These instructions are a replacement for the video instructions on how to assemble the Z-axis assembly and router/spindle mount. The updated Z-axis Assembly includes mounts for varying sizes compatible with the Porter Cable 890, 7518, and a 2.2 kW spindle with a dust shoe. 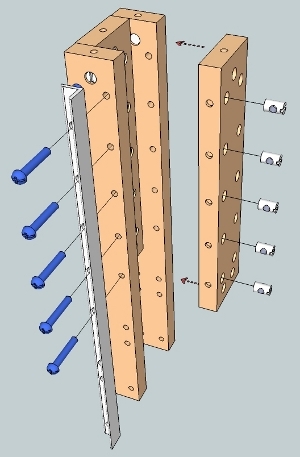 Parts needed: Two long pieces on the sides (z-axis rail support side), one middle z-axis rail support (long), 10 cross dowels and 10 screws at 1/4" x 1-1/2". 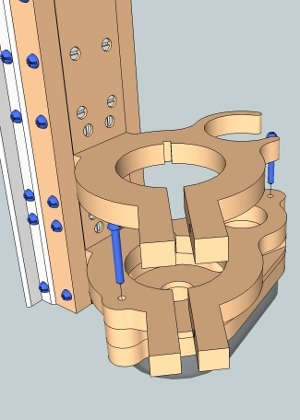 The two z-axis rail support sides will sandwich the wider piece in the middle. Leave the screws loosened. 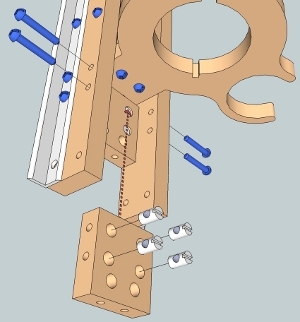 Parts needed: Z-axis rail (the rail that matches the hole positions and orientation shown in the illustration), one middle z-axis rail support (long), 5 cross dowels and 5 screws at 1/4" x 1-1/2". 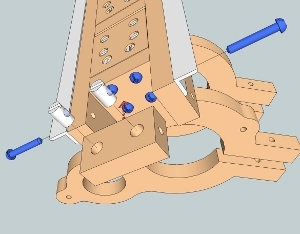 With the rail positioned on the z-axis side rail support, add the cross dowels and loosely fasten the screws into the cross dowels as shown in the illustration. 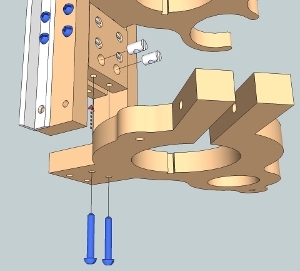 Parts needed: Z-axis rail (the rail that matches the hole positions and orientation shown in the illustration), one middle z-axis rail support (long), 5 cross dowels and 5 screws at 1/4" x 1-1/2". 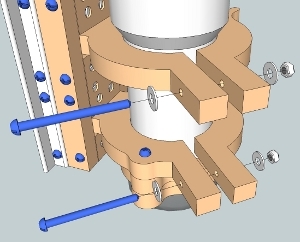 Repeated step for other side of the z-axis. Leave the screws loosened. 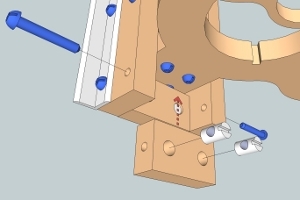 For the spindle z-axis kit, the middle z-axis rail support will look very similar to the part that is positioned just below. To properly identify this part, there will be 9 holes on the face of the part. Parts needed: Top router mount, 2 cross dowels and 2 screws at 1/4" x 1-1/2". Fasten the top router mount with the two screws and cross dowels as shown in the illustration. Parts needed: 2 cross dowels and 2 screws at 1/4" x 1-1/2". Fasten the back portion of the top router mount with the two screws and cross dowels as shown in the illustration. Fully tighten these four screws as there will be no access to these screws in later steps. 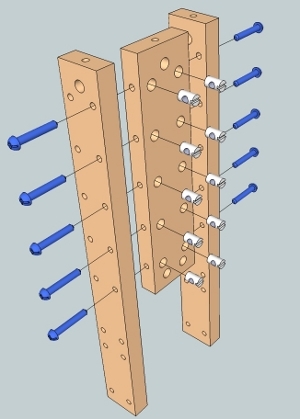 Parts needed: Middle rail support (medium length), 4 cross dowels and 4 screws at 1/4" x 1-1/2". 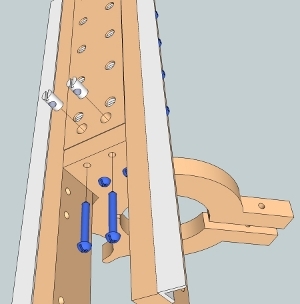 Fasten the middle rail support along the back of the z-axis assembly as shown in the illustration. 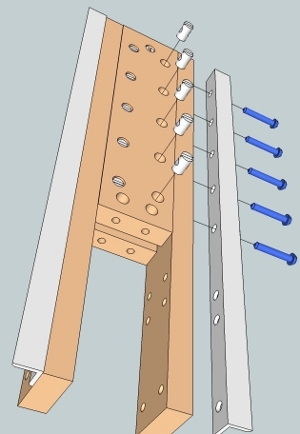 Parts needed: Middle rail support (medium length), 4 cross dowels and 4 screws at 1/4" x 1-1/2". 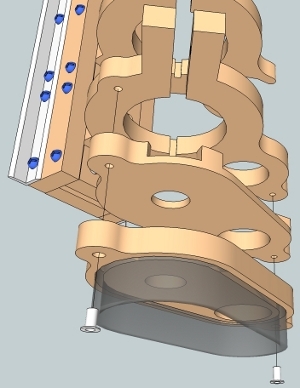 Fasten the middle rail support along the front of the z-axis assembly as shown in the illustration. Parts needed: Bottom Router Mount, 2 cross dowels and 2 screws at 1/4" x 1-1/2". Fasten the bottom router mount using the two front holes of the router mount as shown inthe illustration. Parts needed: 2 cross dowels and 2 screws at 1/4" x 1-1/2". 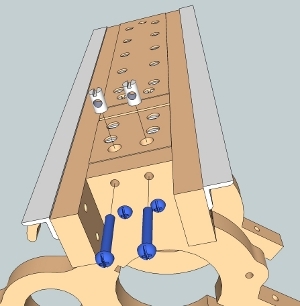 Fasten the back portion of the bottom router mount as shown in the illustration. Fully tighten these four screws as there will be no access to these screws in later steps. 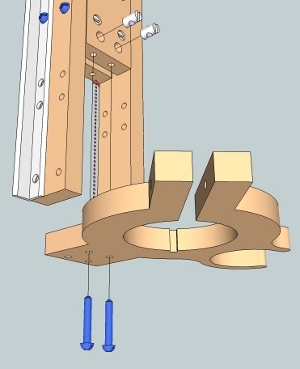 Parts needed: Middle z-axis rail support (short), 2 cross dowels and 2 screws at 1/4" x 1-1/2". Position the middle z-axis rail support and fasten this part with the screws and cross dowels as shown in the illustration for the back of the z-axis assembly. 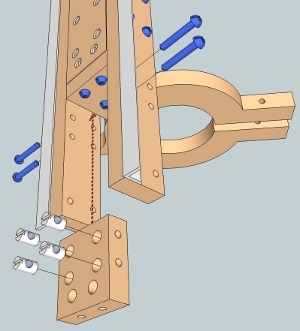 Parts needed: Middle z-axis rail support (short), 2 cross dowels and 2 screws at 1/4" x 1-1/2". Position the middle z-axis rail support and fasten this part with the screws and cross dowels as shown in the illustration for the front of the z-axis assembly. At this point of the assembly, lay the entire assembly on a flat table oriented so that the rails are against the table. Tighten all of the loose screws making sure that the assembly stays flat on the table. This will insure that the rails are as parallel to each other as possible. Parts needed: Top and bottom dust shoe and 2 nut inserts 1/4". Drive in the nut inserts into the dust shoe that contains the brush using an allen wrench. 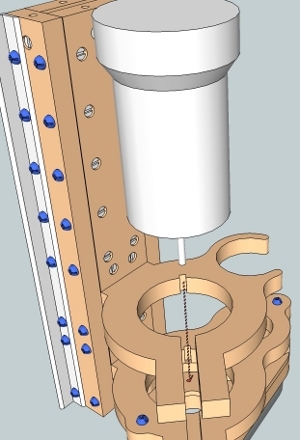 Position the dust shoe parts as shown in the illustration in preparation for the next step. Parts needed: 2 screws at 1/4" x 2". Insert the screws at the top of the bottom router mountand tighten the screws into the nut inserts. A short or angled screws driver will be needed for one tightening one of these screws. Parts needed: Router or spindle. This step can be done after the machine is completely assembled. Slide the router or spindle through the openings of the router mounts. If the routers contain dimples on the side, orient the router so that the dimple is aligned with the notch in the router mount. Ant obstructions fastened to the side of the router will need to be removed prior to installing the router to the z-axis assembly. Parts needed: 2 screws at 1/4" x 3", 4 washers 1/4" and 2 nuts 1/4". These components are used to firmly squeeze the router mounts rount the housing of the router. Gently tighten the screws until the router is secure.